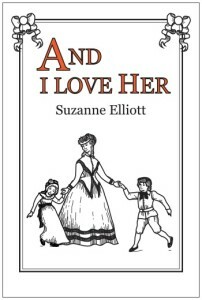 The following is a guest post by Suzanne Elliott, author of And I Love Her. If you would like to write a guest post on my blog, please send me an e-mail at contact@cecilesune.com. I like to place fictional characters into real life events which fascinate me. All of the events which happen in my novel actually happened – a man was publically hanged towards the end of the second Opium War and the Battle of Isandlwana was a catastrophe which was hushed up by the British government. I can’t write all gloom and doom though, it just isn’t in my nature to do so or view life that way which is why my characters always get a satisfactory, if not a happy, ending. I love to do historical research as it turns up the oddest facts – Queen Victoria did actually request that debutantes wear feathers in their hair. It is the women of history who interest me more than the men; purely because they had very little voice and the few who did have been painted by history as scandalous. It intrigues me how a woman like Anne Boleyn would be received in the modern world or if those women submitted as much as we are led to believe. It is down to this that my novels tend to be female led. Not because I dislike men (most of my male characters are fairly sympathetic), but I do think that men have had their say. Felicity, during the novel you are repeatedly accused of being scandalous. How do you respond to this? Laughs. I take it as a compliment! All of the best people have a little scandal to them. I happily anticipate a day where all women are as scandalous as I am. Did you ever consider quitting dressmaking to become a ‘proper’ society wife? No, never. I have nothing in common with most of the society wives. You sound quite proud of that? Do you think that is slightly prejudiced? No question. I was fond enough of Lady Caroline to name my daughter after her. Sadly, she was an exception rather than the rule. Do you think that your behavior is somewhat unfair to your husband and daughter? I like to think that they are both proud of me. James has never had any patience with conventions, anyway. Faith is merely grateful that she is well dressed. We see you being attached to both your sister and daughter. Do you think this is out of character for such an ambitious woman? Not at all! What a strange question. Are you implying that only a woman who stays at home baking bread is a loving mother? You and your husband had a rocky beginning. How is your relationship now? How are relations with the rest of your family? If you speak of my father’s family then I don’t speak with them. I don’t ill-wish them anymore; I just don’t think that I have anything in common with them. In every way that counts, Betsy has been my mother for well over a decade now. I haven’t seen my parents for years. Once again, I just don’t think I have anything in common with them. Do you see why people might think that your attitude is a little harsh and unforgiving? Yes, of course. I have had many hardships in my life so I prefer to hang on to the people and things which make me happy rather than those which don’t. What do you consider as your best and worst character traits? I am very sensible. It’s both a good and bad thing. I don’t get to have the adventures my husband does, but I do keep us out of trouble. As you have said, I can be prejudiced and short tempered too. I am very loyal to those who I love. Finally, what are your dreams for the future? I am retiring to my husband’s country house to live quietly. If I miss the city then I am sure I can employ a local boy to mug me on occasion. Aside from that I wish health and happiness for all of my friends and family. That is my dream. London 1860; two very different women find themselves pregnant by men from the same family. One brings joy and the other hardship and adventure. Follow the lives and loves of the family as their children grow and their lives change beyond all recognition. Suzanne Elliott graduated from the University of Greenwich in 2005 with a degree in politics. After travelling for a while, she settled in East Sussex where she spends her days pottering in the garden and explaining to her dog that Labradors can get ASBOs.